IN this long-dated review, I focus on the quantum and destination of South African platinum exportsand the impact the destination has on the above-ground stocks and on the platinum price. 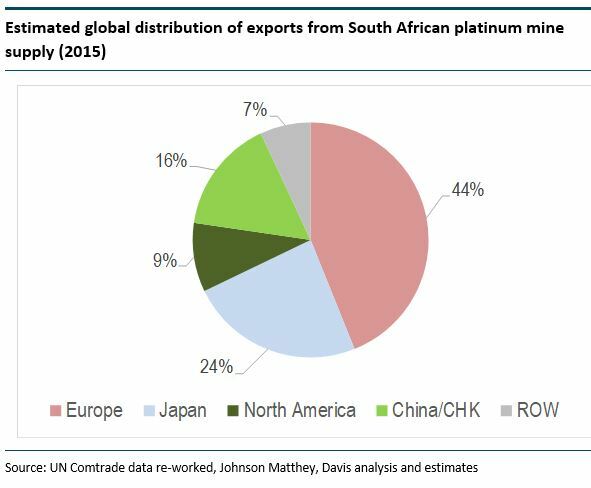 My research highlights the significant influence that South African platinum production has, particularly on exports to Europe and Japan, which amount to some 68% or c.3.1 million ounces (m oz) of South African supply. South Africa produces c.73%, or around c.4.5moz, of the c.6.1moz of global production (JM). The industry does not report South African platinum export data by destination, either globally or by region. Platinum production in South Africa has been in general decline since 2007, caused mainly by the combined effects of prolonged industrial action (five-month strike in 2014) electricity shortages, increasing costs, reduction in capital expenditure, the legal and political environment (Section 54 of the Mining Charter) and a drop in the platinum price. Over this period, a number of mine shafts were shut down or put on care and maintenance. In 2017, around 30% to 35% of South Africa’s platinum equivalent ounces were produced at an all-in sustainable cost (USD/Pt Eq oz) above the average annual platinum price of USD953/oz (Minxcon). Note that in 2018 the average expected USD platinum price and exchange rate will fall, y-on-y by around 5% and remain relatively unchanged. In this regard, a 5% decline in the platinum price coupled with an increase in mine inflation will have a negative impact on revenues in 2018. Clearly, should the platinum price remain depressed in the short to medium term these platinum equivalent ounces will be in jeopardy and as a result an acceleration in shaft/mine closures is likely. Going forward, the market is of the view that there is an increasing risk of a decline in supply from South African platinum mines. This is despite a depreciation of the currency and the significant increase in the rhodium price, which doubled in 2017. South African platinum mining companies have built up long-standing relationships and have long-term contractual agreements with major refineries and manufacturers worldwide. Most of these mining companies sell mainly into Europe (the United Kingdom, Switzerland and Germany) Japan, North America and China. What then does the role of the destination of South African platinum exports play in the quantum of above-ground stocks, the supply-and-demand equation and ultimately the price? My data implies that the estimated above-ground global platinum inventory has been and still is large despite being in general decline since 1993. I also found that regional destocking and redistribution of the above-ground inventory was substantial between 1993 and 2015, leaving Europe fast becoming denuded of above-ground investment stocks, Japan low in stocks, while China and North America have built up their stocks. To Europe: Around c.2moz, which represents c.39% of total imports of c.5.0moz and 44% of South African mine supply. The United Kingdom, Switzerland and Germany accounted for c.97% of South African exports to Europe. To Japan: Around 1.1moz, which represents c.69% of total imports of c.1.6moz and c.24% of South African mine supply. To China: Some c.0.7moz, which represents c.20% of total imports of c.3.5moz and c.16% of South African mine supply. To the Rest of the World: Around 0.3moz, which represents some 12% of total imports of c.2.6moz and c.7% of South African mine supply. The total exports of platinum from South Africa amounted to c.4.5moz which, as expected, is similar in quantum to mine supply. My data highlights the significance of the destination and the quantum of South African platinum exports, particularly to Europe and Japan, which amount to some 68% or c.3.1moz of South African supply. North America and the Rest of the World imported c 16% or some 0.7moz of South African mine supply. China imports some 16% of South African mine supply. Research shows that Europe dominates global platinum imports and exports. In this regard, it appears that Europe acts as a global conduit for platinum, accounting for c.58% of global exports. Europe, however, has been consistently drawing on its above-ground investment stocks to maintain its current export demand. I am of the view that the above-ground investment stocks are now becoming denuded. I argue that Europe will likely have to look to the market for stock by way of additional platinum imports from global investor holdings in three to five years when stocks are likely to be depleted. 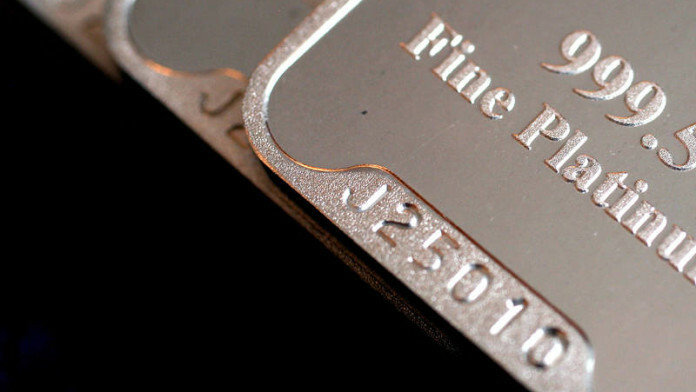 In this regard, upward pressure on the platinum price will be inevitable in the long term. Much, however, depends on the expected rate of decline in South African mine production. Under these circumstances, a reduction in exports to Europe would tighten the market further as Europe will have to source additional stocks to offset the decline in South African supply. My data indicates that the European market will have to draw mainly from North American inventories at a price. My research implies that a decline in South African platinum mine supply will have the greatest impact on Europe, Japan, China, North America and the Rest of the World. About Dr David Davis PhD MSc MBL CEng CChem FIMMM FSAIMM FRIC. David has been associated with the South African mining industry and mining investment industry for the past 40 years. At present, David is working as an independent precious metal consultant. David’s PhD involved: “Studies in the catalytic reduction and decomposition of nitric oxide 1976”.